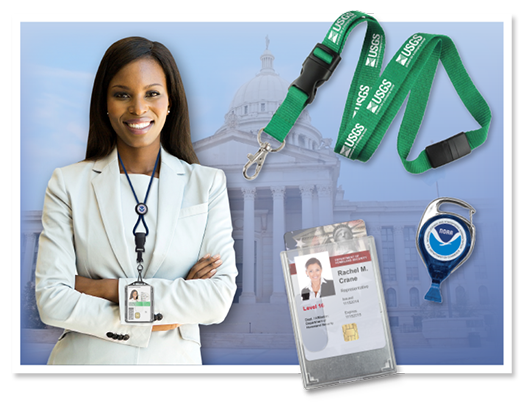 Custom Products for Government - KA Industries, Inc.
Nobody has more knowledge or experience required to assist the federal market with identity management needs then does K&A Industries. Specializing in FIPS-201 approved products designed to meet HSPD-12 compliance regulations, we have delivered in excess of 3 million pieces of FIPS-201 approved shielded badge holders for use with federally issued PIV, CAC and TWIC credentials. Looking to brand your lanyards or badge reels with your agency logo? We have created custom products for virtually every agency, department, and component, whether civilian or military. We have artwork and custom designs on file and cataloged to expedite the production process and deliver high quality, professional products in quick timeframes. Have a need to add custom hang tags to your employee or contractor badges? Let us design a product that delivers the right message. We have completed custom projects, both large and small in scale, that include military service recognition, title and department names, emergency code, evacuation procedures and mission statements along with a whole host of other messages. With an incredibly large federal client list, find out what they already know, and ask us how “We Do ID Right”!